You know I love to save a penny (an actual genuine coin not avoiding going for a wee, yeah?) and will often go to great lengths to do so. In extreme cases I have rummaged through bins at the market and come away with a harvest festival style haul, and I make a lot of Stuff in an attempt to not buy Things. This is the Way of Paying the Mortgage and Also Spending Your Saved Pennies on Old Bits and Bobs At Car Boot Fairs. However, today it has been ALL GO on the foraging front. 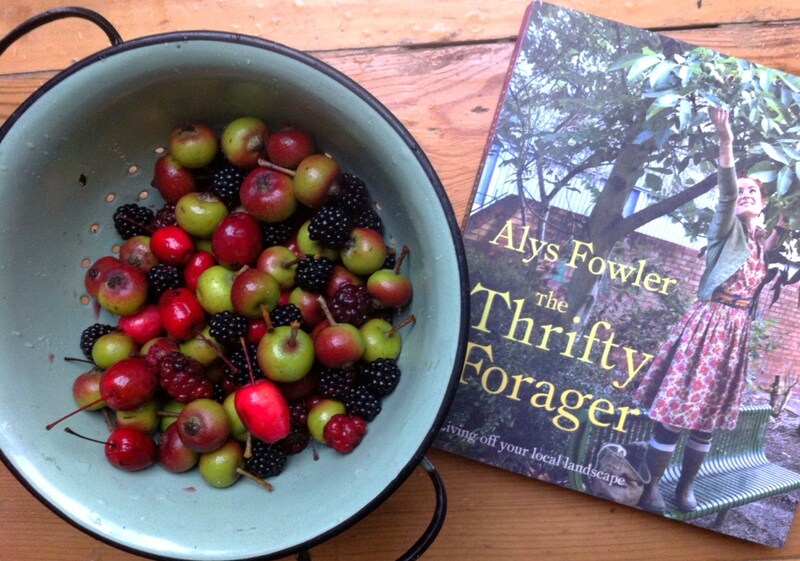 I was given “The Thrifty Forager” by Alys Fowler for my birthday last week and I spend every spare minute reading it. Honestly, that Alys is tighter than ME. She will spend the afternoon digging around for roots of things, spend an hour cleaning it and then a night infusing it and then a day making chutney out of it, with cardamom, all to save about 70p. It was chucking it down today, but I had made up my mind to get out there and so stubbornly I went. I was planning to get some mulberries but on my way to the mulberry tree saw a huge windfall of fruit beneath the cherry tree. We have loads of urban cherries round here, they were planted yonks ago as a budget and pollution hardy bit of foliage. I popped over the fence and only had to endure one shout of “Lost something, love?” (not said with much love) and a handful of suspicious glares. It was a good job I got so lucky with the cherries as the mulberry tree was a she-devil. There were only about 3 ripe berries on it and every time I reached for one my hair (er, bee’s nest) got tangled in a wizened branch and I had to spend several minutes unknotting myself. I then spent about a million years, with a lot of elbow grease, making a tiny amount of fruit leathers. They are those chewy fruity rolls, quite popular at the moment with the little ones. Ours were delicious, basically free and despite the hard labour, made me feel BRILLIANT. There is something about putting in a bit of effort in order to get a cool live-off-the-land-y result that makes it totally worthwhile. Of course, I jest about all the work. Foraging like this is an activity in itself, a way of connecting with nature in an extremely urban setting, and a chance to spot the wild beauty amongst the housing estates and fried chicken shops. It is also an opportunity, just for an afternoon, to step out of a global food system which is pretty wrought. Where there are equal numbers of obese and malnourished people, where supermarkets throw out their waste and pour bleach on so no one can salvage it and where staple crops in poor countries are being turned into fuel for rich ones. GAH. As I untangled my accidental dreadlocks from the vengeful mulberry tree I was able to reflect on all this. And as my fruity leathers got stuck in my cavities I pledged to GET RIGHT ON BOARD WITH THIS FORAGING MALARKEY! Cut off the bad bits of fruit and then chuck in the pan with the water. Add any spices you like- I chose a teaspoon of cinnamon. Cook slowly until the fruit softens. Mash it all up. Have a little taste. Mine was made with unripe mulberries, sour cherries and rank crab apples so needed a fair bit of sugar to help it along. If you have found succulent pears, sweet blackberries and juicy plums you might not even need a single grain. Smear it on to baking paper as thin as possible, mine was about 0.3 cm. Put it in your dehydrater, airing cupboard or oven on loooow heat for between 4-8 hours. I got bored at 3 so ours is less leathery and more gummy-chewy. The drying process preserves it completely so it will last forevs in your fridge but ours will be gone by tomorrow lunchtime so Da Nada. Have you tried a bit of foraging? Made anything ace? I am linking up with a Green Blogger Meet and greet hosted here, weeee! And also the October Festival of Food. Jessica from Delicious Obsessions shares her recipe for Lemon Coconut Blueberry Macadamia Nut Muffins, a low-carb, low-sugar treat that won’t leave you feeling guilty. You can also find Jessica on Facebook. Abbie at Farmer’s Daughter shares a recipe for Unsweetened Cinnamon Applesauce in the slow cooker, a yummy treat that also makes the house smell amazing. You can also find Abbie on Facebook. Lulastic of Lulastic and the Hippy Shake shares a story of urban foraging, and the delicious recipe for the Fruit Leathers she made with the harvest! You can also find Lulastic on Facebook. Jennifer at Hybrid Rasta Mama shares a super easy, fix it and forget about it Crock Pot Pumpkin Custard that tastes like warm pumpkin pie filling without the sugar and grains! You can also find Jennifer on Facebook. Bianca at the Pierogie Mama justifies why she guards her homemade applesauce from ‘unauthorized’ uses. You can also find Bianca on Facebook. Jennifer from True Confessions of a Real Mommy helps you take your love of all things pumpkin to the dinner table! A gluten free, dairy free, and vegan if you like Thai Pumpkin Soup to warm you up! You can also find Jennifer on Facebook. Crackerdog Sam guest posts at Hobo Mama with a slightly sweet, stove-popped Cracker Jack alternative. You can also find Hobo Mama talking about Crackerdog Sam on Facebook. Luschka at Diary of a First Child shares her foundation recipe for ‘milkshakes’ – coloured green smoothies – that her toddler loves to have with ‘chocolate’ date balls and banana ‘ice cream’. You can also fine Luschka on Facebook. Amy at Anktangle shares a wholesome version of a decadent treat: Chocolate Peanut Butter Granola Bars. They have a classic, no-bake cookie flavor while being gluten-free, sugar-free, and vegan. Nut-free substitutions included! You can also find Amy on Facebook. 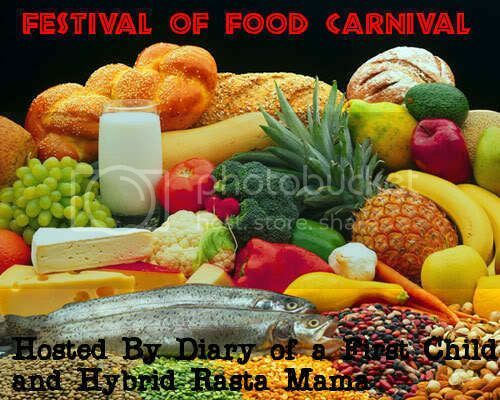 Festival of Food Carnival Facebook page. I have this book and it is totally ace, I got some apples and made some apple pies and apple crumbles. She is due to launch another book next year on preserving and I cant wait. Ohh apple wine is very nice and uber strong!!! there has been a lot of rainfall this year, so there wont be many around, my neighbour gave me hers as she doesnt do anything with them. Also Bramble jelly is really nice as is bramble vodka. oo fruit leather – one of our faves : ) having a highly allergic to all sorts little boy, it’s one of our treat standbys – who needs chocolate? Around about 1990 mum (way ahead of her time as always) got sick of us kids wanting “bought” things like our mates had, and made “roll ups” (the new cool thing) aka fruit leathers with the golden queen peaches from our back yard (NZ slightly-urban beats pants off London I’m guessing? In fruitstakes only of course!). I was so proud/excited/loving them … Still vividly remember getting to eat them – gymnastics all morning and then the peach leather … Delicious. have not the same skills as mum but maybe when the girls nag sufficiently ?? Wow, your mum is a total LEGEND! Flipping heck, peach ones would be absolutely divine. Do make them Jess- seriously dead easy! In terms of fruit – NZ has AMAZING fruit but loads LESS public space. So unless you know people with the trees in the gardens it is hard to find more than lemons. In London every street has a park, and no houses really have gardens with fruit trees, so it is brilliant for public foraging. I can’t wait for the fig trees to ripen… weeee! Hey there, I’m visiting London in a couple of weeks and would live to know the best charity shops to visit?? Any advice? Hope you find lots of lovely things! We love to forage … and it’s amazing how much food is out there for the taking. For the past few weeks, we’ve been collecting chestnuts. They grow all over our area but most people won’t bother with them … or maybe they just don’t know what they have. Either way, they are there for us and we make the most of it. After cooking and peeling them, they get tossed in the freezer and we enjoy them all winter long. We’ve also foraged for blueberries, apples, figs, and blackberries … although it’s hard to collect enough for preserving because we love eating them fresh. 🙂 In the next month or so, we’ll be after black walnuts. We’re pretty forage-y, although unfortunately my favourite spot for cherry plum windfall picking is right next to primary school (as are the best sloe bushes) so I get the added thrill of random mums waving at me and asking what the hell I’m doing whilst crashing about in the undergrowth. Also, every time I look out of my window I feel guilty that I haven’t yet done anything with all the apple windfalls. It just takes so bloody long peeling and de bruising the buggers, AND they’ll probably be covered in slugs. I HAVE done the plum vodka and made some blackberry compote though, so not all bad. Yeah, tell me about the chopping bruises, only gave myself a blister yesterday, didn’t I?! I often get funny looks off people and then they ask am I poor! I just like doing it, my dad used to bring home bags of brambles which drove mother mad!!!! But boy do they make a good crumble!!!! I fancy trying the fruits of the fuschia, but people round here will deffo think I have lost it!!!! People are used to going to the supermarket and it drives me mad. I hate the bloody places! The only 2 I will consider stepping into are Aldi and Morrisons. The first one more so. I was going to go bramble picking with the dog, but all it has done is rain!!!! So I might try tomorrrow. Fingers crossed!!!! Oh nooo! So good having a book, really able to check each description etc. I need to look out for sloes! you are ALL so inspiring. wow. I LOVE it that you’re foraging in an urban setting. we have tons of chestnuts in our neighbourhood too and i’ve been told that they’re “horse chestnuts” read: inedible – but they look just like the ones that vendors on the street in downtown Vancouver sell, so i wonder if i should try them. i didn’t realize you could freeze them. a friend recently gave me a lovely jar of plum jam made from fruit she foraged in a local park. it was divine! and here’s a tip for apple windfalls – i used to make apple sauce from windfalls of a crappy little apple tree we had in our backyard. i called them “two bite apples” because they were so small that it only took two bites to eat one. can you imagine peeling enough of those to bake/cook with? no way! so i just cut them in half, threw them into a pot stems, bruises and all and cooked the bejeezus out of them. then you just push it all through a strainer and voila! beautiful apple sauce! if you have red skinned apples the sauce is pinkish, which is kind of cool. Oh, fabulous trick! Crab apples are tiny weeny so great to know. I didn’t bother peeling for this either- I think straining helps alot. I cracked open a chestnut today but there was no nut inside 🙁 I need to investigate chestnuts a bit more I think. Yey for free organic British food!!! I am the neighborhood foraging for sure! I see some fruit, berries, or nuts and I am all over them! Fruit leathers are one of my favorite preservation methods! Thanks for sharing! You are amazing! We forage for blackberries around here but not much else. I love the idea of making our own fruit leathers — brilliant use! I love this! I had some fruit leathers recently and thought I must figure out how to make them! You’ve saved me the trouble, thanks! Are you in London? I used to forage once a month with a fantastic group near Brixton. Let me know if you want their details, I’ll look it up.